Therapists' Apps Aim To Help With Mental Health Issues : Shots - Health News There are lots of apps out there that claim to improve your mental health, but precious few have actually been tested to see if they work. Psychologists are starting to give that a try. The ReliefLink app is a mood-tracking tool intended to help people who are contemplating suicide. Games like Flappy Bird and Candy Crush have helped many of us de-stress during long waits at the doctor's office and crowded Metro rides. But what if an app could actually help with mental health? Researchers from Hunter College and the City University of New York say they've developed an app that can reduce anxiety. In the game, called PersonalZen, players encounter two animated characters in a field of grass. One of them looks calm and friendly, while the other looks angry. Soothing music plays in the background. When one creature burrows into the grass, players must follow the rustling leaves and trace its path. It's not quite as exciting Flappy Bird, but the researchers found that it helped anxious people. We tried it out, and found that focusing on keeping track of those sprites was more challenging than we initially expected. "What this game is doing is trying to train your attention toward the positive," says Tracy Dennis, a professor of psychology at Hunter and the lead researcher behind the game. It's modeled after a cognitive treatment for anxiety called attention-bias modification training, Dennis tells Shots. The idea is that if people can learn to ignore threatening stimuli and focus on the good, they'll feel less anxious in stressful situations. The researchers tested the game on 75 people who scored high on an anxiety survey. Participants who played the game for either 25 or 45 minutes were less nervous when they then delivered a speech than those in the placebo group. The results were published last week in Clinical Psychological Science. The researchers don't know if the game also works for more severe clinically diagnosed anxiety. And Dennis and her colleagues are now looking into whether shorter stints of play will have an effect. Dennis says her app could be useful by itself or in conjunction with therapy. "You can think of it as a vitamin, or you can think of it as a pain killer," she says. People with mild anxiety might use it as a way to build resilience, whereas people with more severe symptoms might use it in between appointments with a therapist. Gamification — the use of video game techniques to do more than just entertain — is a big buzzword these days. It's being used in management, education and advertising. There are hundreds of mental health apps already on the market, and many incorporate elements of gamification. But few are based on scientific research. "When it comes to mobile technology, it's sort of the Wild West right now," Dennis says. "A lot of app developers are not researchers," says Nadine Kaslow, president of the American Psychological Association and vice-chair of Emory University's psychiatry and behavioral sciences department. A suicide-prevention app that Kaslow designed won the Substance Abuse and Mental Health Services Administration's app contest last year. Her app, called ReliefLink, is more of a mood-tracking tool than a video game. 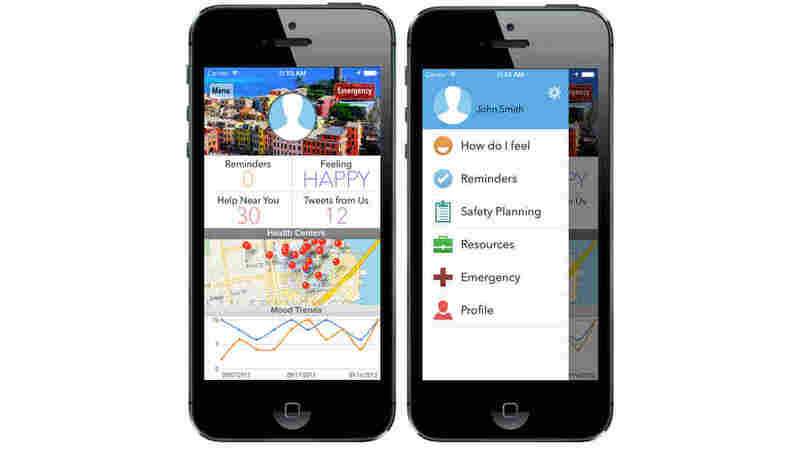 It tweets users regular affirmations, helps them make a safety plan and puts them it touch with nearby resources if they're contemplating suicide. Koslow says she is starting to test the app's effectivness. Apps like ReliefLink that can be used in conjunction with therapy are getting more scientific attention these days. A study in JAMA Psychiatry, published Wednesday, found that a similar app designed to help recovering alcoholics stay on track helped users avoid risky drinking. Researchers at the University of Wisconsin-Madison compared about 170 patients receiving counseling for alcoholism with 170 who were using the A-CHESS app. (The app can be downloaded for Android phones.) The app includes relaxation tutorials, as well as a panic button that connects users to their families or counselors. It also alerts users if they are approaching a high-risk environment (like a bar they used to frequent) and helps them keep track of their progress. Those who used the app reported fewer days of excessive drinking, and they were more likely to be completely abstinent. "I think that the use of technology in mental health treatment is relatively new," Kaslow tells Shots. But idea of using games to help those with mental health problems build resilience isn't novel, Kaslow says. Researchers have more often focused on using these techniques with children. But now that it's common for adults to play games on their phones, that might start to change, she says. And even an app by itself might be better than nothing. "There's a lot of stigma associated with mental health problems," Kaslow says. "A lot of people are willing to download an app but not see a therapist."